I saw an orange color squeaking through the shaded window this morning, so took a peek. Yikes! 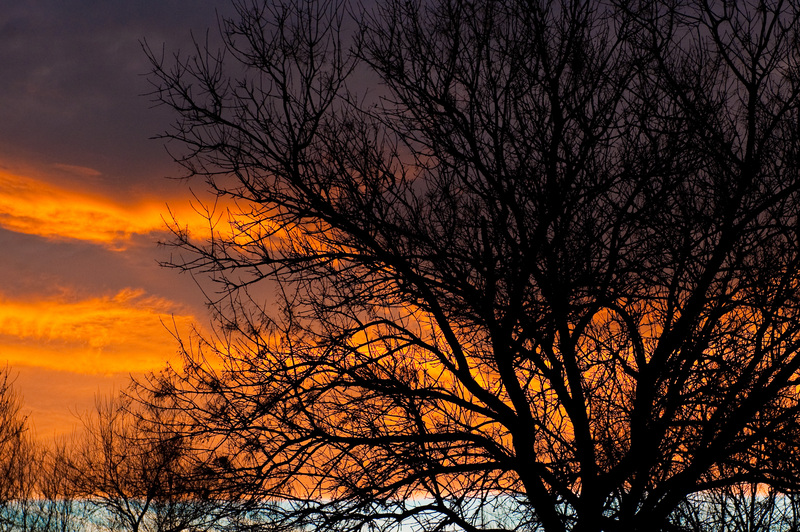 A particularly good sunrise was in progress so I ran outside with the camera and snapped a few frames. This almost takes on a abstract quality, or perhaps that’s just wishful thinking. Anyhow, it would have been a great morning to be set up with a great foreground to the east, but sometimes you have to work with what you have on hand. After all of yesterdays talk I decided to set an alarm and venture out to see the eclipse between approximately 1:30am and 2:00am central U.S. time. As those of you who saw it know, the moon was very high overhead so getting any arty foreground objects in the frame was a problem, at least here in the central U.S. 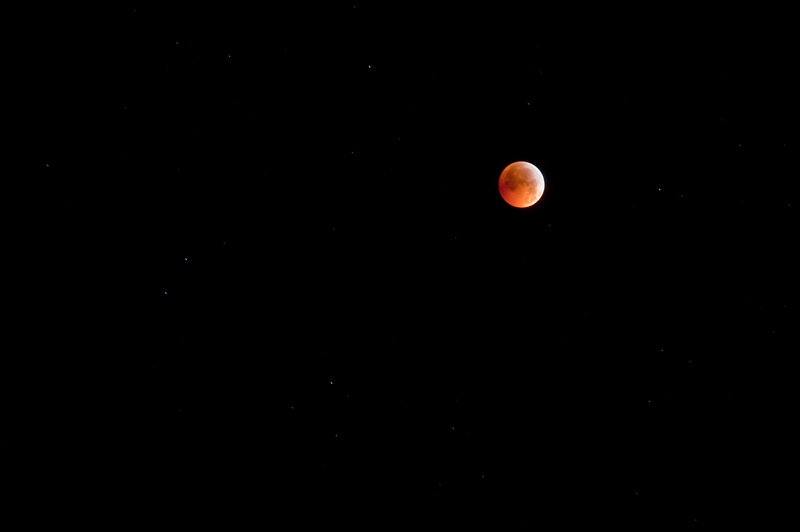 This was shot with my D700, ISO 3200, 180mm, f/11 at 3.2 seconds. If you click the image for the larger version you can better see the numerous stars (that were starting to trail even at 3.2 seconds) detected by the camera. This was early in totality, clouds moved in soon after and spoiled my intent to get the eclipsing moon and the constellation Orion in the same frame. By the way, it looked cool! The Warped Prism is back, although perhaps with somewhat less frequent postings for the near future. It was on an unscheduled hiatus due to health issues with yours truly, but I am now on the mend. 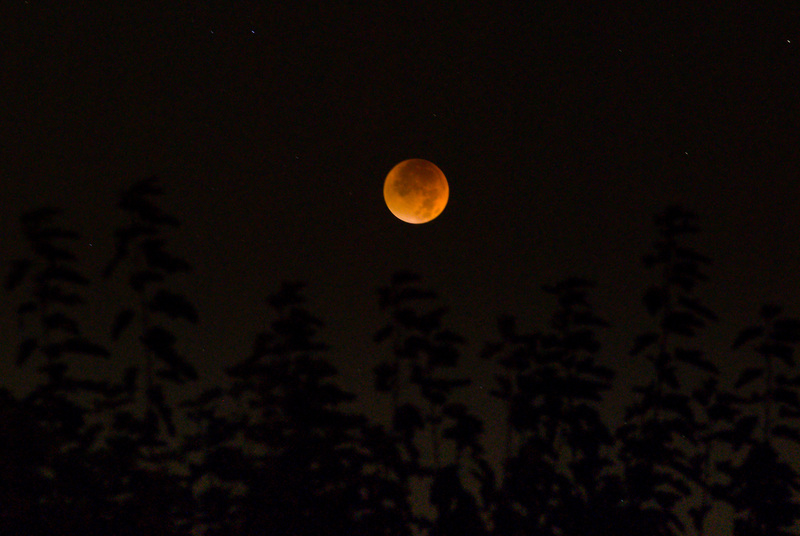 This is a total lunar eclipse from 2007, shot from my front yard. I used my Nikon D200, which does not have the incredible low light/low noise capabilities of my current D700. This is more of a documentary shot I suppose, not art. Hey, I broke the rule of thirds! There is another lunar eclipse tonight, coinciding with the winter solstice, which hasn’t happened for 456 years if my information source is correct. I encourage everybody to go out tonight/this morning and photograph the heck out of this thing. Me, I will likely be asleep. Everybody should check out the cool moon photo posted at http://oneowner.wordpress.com , now that’s good stuff.